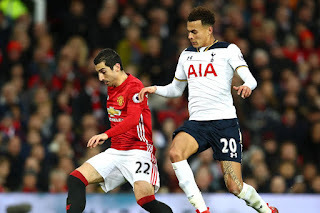 Tottenham Hotspur hosts Arsenal in the Premier League at Wembley Stadium on Saturday February 10, as Tottenham and Arsenal are outside the top four, looking in. Today's clash is one of the most important meetings in years as Arsenal take the next chapter of thee north London derby on the road. Tottenham enter the clash sits is fifth place in the Premier league with 49 points, while Arsenal is sixth with 45 points, so both teams need the points to keep up their pursuit of Champions League soccer next season. Tottenham line-up: Lloris; Trippier, Sanchez, Vertonghen, Davies; Dier, Dembele, Eriksen; Dele, Son, Kane. Mentionsed Spurs beat Arsenal 2-0 in the last ever north London derby to be held at White Hart Lane back in April. No Comment to " Tottenham Hotspur v Arsenal live stream info "